There’s a lot of talk about “nutrient density” and “superfoods”, but what do these terms really mean? Which foods actually give the most nutritional bang for your calorie buck? That is, which foods provide the most nutrients for the least number of calories? Some approaches to quantifying nutrient density (e.g. Joel Fuhrman’s Aggregate Nutrient Density Index) have looked at vitamins and minerals (along with other parameters that are only available for fruits and vegetables) per calorie, but do not consider essential fatty acids and amino acids. Meanwhile, Registered Dietitians’ recommendations and mainstream food ranking approaches revolve around avoiding nutrients such as saturated fat, cholesterol and salt. Unfortunately, this avoidance based approach to ranking foods does nothing to increase beneficial nutrients. Avoidance of these demonised food elements typically ends up ignoring the whole unprocessed foods that contain the most nutrients. Instead, current ranking systems encourage prioritisation of processed foods that have been manufactured to be low in fat, saturated fat, salt or cholesterol. The resultant fat-free manufactured products are so nutrient poor that they must be fortified with a smattering of synthetic vitamins to prevent the malnutrition that would otherwise occur. Food manufacturers also add sugar and synthetic flavours to make them palatable. After a few decades, food scientists have now learned to optimise sweetness to target “bliss point” which continues to drive upwards in sweetness. With synthetic flavourings, we can make hyperpalatable food stuffs that taste so much more intense than real foods that are found in nature. After a generation or two of fake food we have forgotten what real food, in its natural form, tastes or even looks like. Unfortunately, at the same time our food production is becoming more reliant on fertilisers to grow crops bigger and faster but the end result is food that doesn’t naturally taste as good as they used to because they don’t contain the same number of nutrients. Our senses of taste and smell don’t have a chance of being able to find real nutrients amongst the plethora of super sweet and unnaturally flavoured foods. This industrialized chemical storm also taxes your liver, kidneys, and digestive system and encourages disease instead of leading to health. So, if we can’t trust our senses anymore to find the nutrients we need what can we do? 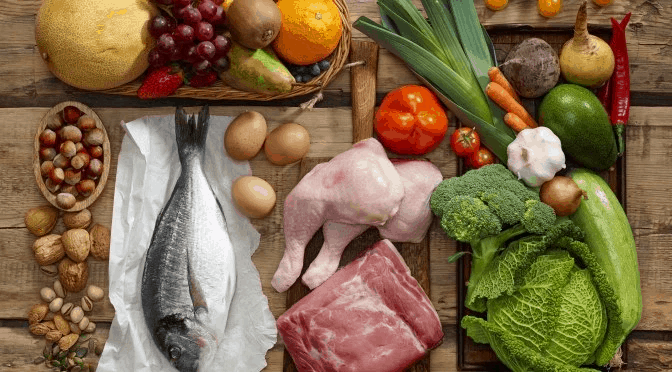 As much as food technology has got us into this mess, the good news is that by quantifying nutrient density we can identify the foods that contain the most nutrients. Then after a period without the distraction of sweeteners and artificial flavours and we can re-learn trust our tongue, nose, appetite and cravings to find the real nutrients that our body need. The chart below shows the nutrients contained in the eight thousand foods in the USDA database per 2000 calories. While it’s easy to get the minimum levels of iron, vitamin C and several the amino acids (at the bottom of the chart), it’s harder to obtain adequate quantities of omega 3 fatty acids, vitamin D, choline, vitamin E and potassium (shown at the top of the list). The chart below lists the nutrients provided by the average of all food in the USDA database (orange bars) compared to the nutrients provided by the most nutrient dense foods (blue bars). But focusing on the most nutrient dense foods, not only do we get more of the harder-to-find nutrients, we also improve the quantity of all the essential nutrients! The chart below shows a comparison of the macronutrients in the most nutrient dense foods compared to the average of all foods in the USDA database. Although we have prioritised for only one amino acid (Tyrosine), it appears that the food that contain the most essential fatty acids, vitamins and minerals are also higher in protein. The quantity of fibre also increases substantially. Nutrient dense vegetables come with large amounts of fibre which makes these foods more filling and harder to overeat. Notice the proportion of fat and non-fibre carbohydrates are lower in the most nutrient dense foods. In a way, I think we need to consider foods as nutrients and fuel separately. The initial goal is to eat the foods that contain the nutrients to live an awesome life and support your bodily functions. The secondary goal is to get enough fuel from higher energy density foods to support your activity and maintain ideal body fat. Too often we sacrifice essential nutrients and nutrient density and instead choose irresistibly tasty and high calorie food products for a “quick rush”. The most nutrient dense foods (i.e. the top 10% of the eight thousand foods in the USDA database) are listed below along with their nutrient density scores (ND) which is based on the harder to find nutrients. If you’re interested in all the gory details of the nutrient density score is calculated you can check out the Building a Better Nutrient Density Index article. But in short the system compared the nutrients per calorie across all the foods in the USDA database. A score is given based on the standard deviation from the mean. If a certain food contains a lot of a certain nutrient it gets a large score. If it contains an average amount of a certain nutrient it gets a zero score. If it contains a little bit or none it gets a negative score. We then sum all these individual nutrients scores for the nutrients that are harder to find that we want to emphasise. If you want to check whether a particular food is nutrient dense I recommend Googling “nutrient data self [insert your favourite food here]” to see how it ranks. For example, the image below shows that spinach does exceptionally well in both the nutrient balance (vitamins and minerals) and protein quality score. Fibrous green vegetables are the highest-ranking nutrient dense foods. Few people argue with the idea that veggies are good for you. The nutrient density analysis confirms this. Spices add flavour and nutrients and plenty of vitamins and minerals. Seafood provides amino acids as well as Omega 3 fatty acids which are harder to get from other foods. Only low fat cream cheese makes the list in terms of nutrients per calorie as other dairy products typically have more fat and not as many essential nutrients per calorie. It’s true that eggs are a nutritional powerhouse of vitamins, minerals and protein. However, when it comes to the harder to find nutrients per calorie non-starchy veggies still win out. It’s a similar story for nuts which don’t make the list. Full fat dairy and nuts can be a great source of energy and nutrition, particularly if you are insulin resistant or have diabetes, but if you’re just looking to maximise the harder to find nutrients per calorie the list of dairy and nuts isn’t that long. Organ meats do well as well. help achieve and maintain overall good health. Maintaining a healthy weight with adequate protein and while avoiding excess energy intake will help you to avoid a lot of the diseases of aging. These foods will also be quite filling and hard to overeat due to the low energy density and high fibre content. At the same time, it will be hard to get enough energy if you just ate from the foods in this list. If you are very active you will also find it hard to in down enough energy for a lot of intense activity. If you are insulin resistant you may want to start out with higher fat foods that will still provide plenty of energy without raising causing blood sugar swings. Eating exclusively from the list of the most nutrient dense foods may not be appropriate for everyone, particularly if you are just starting out on your health food journey. The table below lists several nutritional approaches that are suitable for different people depending on their blood glucose levels / insulin resistance and weight goals. If you’re interested in optimising your diet for nutrient density as well as tailoring it to your blood glucose and weight loss goals I would love you to check out an a new tool I’ve been developing, the Nutrient Optimiser. It will review your food log and, rather than just tracking calories it will identify your biggest nutrient deficiencies and the most nutrient dense foods to fix them. You can also tailor the insulin load of the food recommendations to help normalize blood sugars and then energy density if you still have weight to lose. It’s still early days, but the future looks very exciting! Will the Nutrient Optimizer ever become available elsewhere besides Facebook? I don’t do Facebook. The FB page is just a place to share the example reports and support users. I’ll do a post on the Optimiser soon. It’s a manual spreadsheet process at the moment. The plan is to have an automated web interface and eventually a mobile app. Not a word on nutrient availability? I’ve got a blurb on that in an upcoming post. Any index that rates a fat free or low fat milk product above the normal milk product is — in my opinion — flawed. I ate that crap for decades, thinking that fat was bad for me, but it just caused me hunger and a lack of satisfaction. It may have more nutrients on some arbitrary scale, but in terms of real life with real people, it’s not useful. I’ll take my creme fraiche, thank you. I also think that vegetables are overrated. There is a paucity of RCTs showing vegetables do anything. I used to “have” to have vegetables (not fruit, which causes my blood sugar to skyrocket), but now I don’t. I still eat them, but if I have a meal or several meals without vegetables, I don’t get concerned. Vegetables by and large lack bioavailable nutrients, have anti-nutrients, etc. Heck, eat liver or heart or brains, and those will blow away vegetables for anything other than fiber (which I think is actually bad for me and I’ve transitioned over time to a low fiber diet). I realize you are trying to create a list of nutrient dense foods, but I personally would ignore most of these recommendations. For your other posts, I think those are largely excellent, but for me, this one is going off the rails. As I mention in the article there are pros and cons of very nutrient dense foods. Practically I think you need to think in terms of nutrients and energy. These foods will provide nutrients but not much energy. Nutrient bioavailability is an interesting topic but there doesn’t seem to be any real data either way. Hopefully these lists can help people refine their food choices within their current preferences. I didn’t see milk on the list either? There are differing opinions. The USDA database classes it as a fruit. Good video. Thanks. When I track, my diet is 50 to 65% fat and 20 to 35% protein even when I try to follow the number and eat as many veggies as I can. Veggies look bulky but they don’t make up much in terms of energy, but they do contain some harder to find nutrients. If you’re eating lots of seafood and organ meats you’ll likely be doing great too. I feel like I’ve found buried treasure. I <3 <3 <3 all the methodology and visuals. When do you sleep?!! 1. Why is there little mention of fruit in the lists, (or at least it seems that way to me)? I thought fruit is really good for you. ? 2. Is alcohol not a food? I only saw it mentioned once wrt metabolizing order. Thank you for all your work and dedication! This is all so helpful!! 1. Fruit just doesn’t rank well on a nutrients per calorie, so it doesn’t make the cut. 2. Similarly, alcohol doesn’t make the cut on a nutrients per calorie. Alcohol is also going to be burned first before everything carbs, fat and protein, so ‘consume in moderation’ is probably a reasonable approach. I don’t think you’d be able to develop a meaningful nutritional ranking for alcoholic drinks.